If you're looking for an all-inclusive getaway in the sun and surf, the Caribbean and Mexico are awash with beach resorts, many of which cater towards travelers with children. Many top G-rated resorts offer family-friendly accommodations, kid-friendly menus, and special kids' activities and programming. But some may be better for your family than others, depending on the age of your kids. Where: Beaches Resorts has three locations in the Caribbean. Known for: Beaches is known for kid-centric fun, beautiful beach settings, expansive family-friendly water parks, and a partnership with Sesame Street. They also offer frequent money-saving deals. If we had to pick a favorite: Our top pick is Beaches Turks & Caicos, located a 75-minute flight from Miami, then a 20-minute drive from the airport in Providenciales. (The Jamaican resorts are 80–90 minutes from the airport.) Beaches Turks & Caicos also boasts twice as many restaurants and the biggest waterpark, with five pools and a surf simulator. What's included: The all-inclusive rates cover accommodations, meals, activities (including water sports), children's programs, alcoholic beverages. Cribs and rollaway beds are complimentary upon request. Highchairs are available in restaurants. What's extra: You'll pay up for spa treatments, babysitting after the kids' clubs close (9 p.m. and later). Strollers are available for rent. Accommodations: Beaches offers a variety of room categories, from standard rooms and suites to three-bedroom villas. Activities: In addition to traditional beach and resort activities, Beaches offers complimentary scuba diving. Known for: The brand's properties are favorites for their beautiful beach settings, expansive programming for kids at its family properties. Excellent tennis instruction and water sports; some locations offer workshops on the flying trapeze and other circus-school activities. Like Beaches, Club Med offers plenty of money-saving deals. If we had to pick a favorite: Club Med Ixtapa Pacifica and Club Med Cancun Yucatan both offer exceptionally beautiful beach settings and a wide range of activities for all ages. What's included: The all-inclusive rate covers accommodations, meals, activities (including many water sports), children's programs, alcoholic beverages. Cribs and rollaway beds are complimentary upon request. Highchairs are available in restaurants. The chain also loans out bathtubs, changing tables, bottle warmers, and strollers at no charge. What's extra: You'll pay up for spa treatments, in-room private babysitting, and some excursion-based activities such as horseback riding or scuba diving. Special offers: There are often frequent deep-discount deals, including free nights and other enticements. Kids under 4 always stay and eat free. Accommodations: Club Med Cancun Yucatan offers family suites; other properties offer guest rooms and suites, some with connecting capabilities. Activities: Besides the main pool and beach, there is typically tennis, mini-golf, soccer, table tennis, sailing, archery, basketball, volleyball, a climbing wall, inline skating and, often, Club Med’s signature circus school that was developed with Cirque de Soleil. Kids clubs: The breakdown is as follows: age Baby Club Med (ages 4–23 months); Petit Club Med (ages 2–3); Mini Club Med (ages 4-10); and Club Med Passworld (ages 11–17). Known for: The brand is known for its gorgeous beach settings, laid-back vibe, and affordability. Kids age 12 and under always stay and eat free. If we had to pick a favorite: Set on a dreamy beach surrounded by the fabulously crystalline waters of Aruba, Divi Village Golf & Beach Resort offers convenient villas (studios to two bedrooms) that sleep up to six and feature fully equipped kitchens. What's included: The all-inclusive rate covers accommodations, meals, activities (including non-motorized water sports), children's programs. Cribs and rollaway beds are complimentary upon request. Highchairs are available in restaurants. What's extra: You'll pay extra for spa treatments, motorized water sports, golf, private babysitting services, and alcoholic beverages. Special offers: Sign up for e-alerts to hear about special rates and promotions. Accommodations: Most Divi Resorts offer guest rooms and suites; some properties offer villas. Rooms are very comfortable but not luxurious. Activities: Divi offers multiple pools, bars and restaurants, a 30-foot climbing wall, bikes, a gym, and a children’s camp, as well as.standard resort favorites like snorkeling, scuba diving, and tennis. Kids clubs: Divi Resorts provide a drop-in kids' camp for ages 4 to 12. Activities include scavenger hunts and sandcastle contests, as well as movie nights several times a week. Where: Azul Hotels has three all-inclusive locations in Mexico and two in the Caribbean. Known for: The properties are highly regarded for lovely beach settings, family-friendly vibe, and good deals. The "gourmet-inclusive" concept means a la carte dining and 24-hour room service are also included. If we had to pick a favorite: On Mexico's spectacular Riviera Maya, the Azul Beach Hotel is a beautiful boutique property located right on the beach, just 20 minutes from the Cancun airport. It's a fabulous choice for families with little ones. What's included: The all-inclusive rate covers accommodations, meals, activities (including non-motorized watersports), children's programs. Cribs and rollaway beds are complimentary upon request. Highchairs are available in restaurants. You can borrow baby gear (strollers, cribs, sterilizers, and more) during your stay. What's extra: You'll pay up for spa treatments, motorized water sports, golf, private babysitting services, alcoholic beverages. Special offers: You can almost always find deep discounts and promotions. Accommodations: Azul Hotels offer upscale guest rooms and suites, including swim-up suites. Activities: There are five pools, a gym, children’s camp, as well as standard resort favorites like snorkeling and scuba diving. Kids clubs: Azulitos Play House for kids ages 6 months to 5 years features a Fisher-Price educational play program. The resort also offers Gourmet Gerber, a special all-inclusive meal plan just for babies. The Azulito Kids Club is for older kids ages 6–12. Where: Iberostar has nine all-inclusive family resorts in Mexico and seven in the Caribbean, including the following. Known for: Iberostar resorts have excellent beach settings, family-friendly vibe, and good kids' clubs. Dining is a focus here, so expect a la carte dining (all levels) and limited room service (Gold Premium level) included in the rate. If we had to pick a favorite: On Mexico's Riviera Maya, the Playa Paraiso complex offers a lot of flexibility and tons of rooms and amenities. On the Riviera Nayarit, Iberostar Playa Mita is an upscale resort within easy reach of West Coasters. What's included: The basic all-inclusive rate covers accommodations, meals, activities (including non-motorized water sports), children's programs. Gold Premium–level rates also offer limited room service. What's extra: You'll pay up for spa treatments, motorized water sports, golf, private babysitting services, and alcoholic beverages. 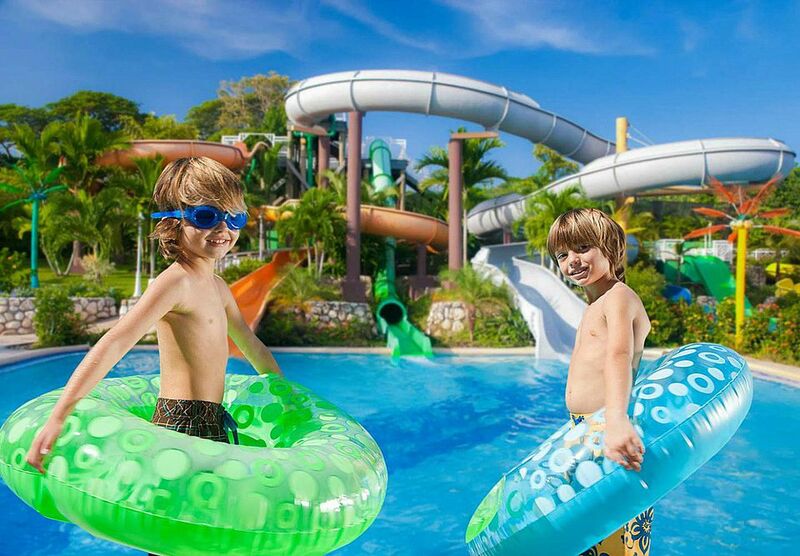 Special offers: Watch out for regular promotions where kids age 12 and under stay free. Accommodations: Iberostar offers upscale guest rooms and suites. Activities: There are pools, splash pads, beach activities, and non-motorized water sports, plus kids' programs. Kids clubs: There are supervised children's program for kids age 4 to 12, plus teen activities. Babysitting (for a fee) is available for younger children. Where: Dreams Resorts & Spas has eight locations in Mexico, four in the Dominican Republic, and one each in the U.S. Virgin Islands, Costa Rica, and Panama. Known for: The brand is known for a luxury all-inclusive beach experience, with superior service and food that's several cuts above average. Meals offer a choice of buffet options and multiple a la carte venues. Resorts are kid-friendly and the clientele is a mix of families and couples and other groups. If we had to pick a favorite: We love Dreams Palm Beach Punta Cana in the Dominican Republic for the truly dreamy beach and terrific kids' programming. What's included: The all-inclusive rate covers accommodations, meals (including room service), activities (including non-motorized water sports), children's programs, and alcoholic beverages. Cribs, highchairs, beach toys, and life jackets are all provided free of charge. Special offers: Frequent kids-stay-free promos. Accommodations: Dreams offers standard guest rooms and suites, many of which can be connected for large family accommodations. Guests in Preferred Club rooms enjoy additional privileges. Activities: There are multiple pools, fabulous beaches, and a wide array of active pursuits during the day. In the evening, there are nightly shows and themed nights. Kids clubs: The Explorer's Club for kids ages 3–12 and Core Zone for teens ages 13–17 are available from morning to night. Best for: Families with kids ages 4 and up; some locations offer a baby club for kids age 1 to 3. Where: Grand Palladium has five locations in Mexico, three in the Dominican Republic, and two in Jamaica. There are also locations in Europe and South America. Known for: At Grand Palladium, you'll find a good-value all-inclusive beach experience where kids age 12 and under stay free. There are spacious suites and numerous dining options. Resorts are kid-friendly and the clientele is a mix of families and couples. If we had to pick a favorite: We love Grand Palladium Punta Cana in the Dominican Republic and Grand Palladium Riviera Resort on Mexico's Riviera Maya. What's included: The all-inclusive rate covers accommodations, meals (including both a la carte and buffet offerings), activities (including non-motorized water sports), children's programs, rollaway beds, and wi-fi. What's extra: You'll pay up for spa treatments, motorized watersports, and babysitting services. Some properties offer baby equipment rentals, including strollers, cribs, and high chairs. Special offers: Look out for discounted rates. Accommodations: The resorts offer spacious suites with hot tubs, balconies, mini refrigerators, and sofa beds. Activities: There are pools, wonderful beaches, and a range of activities during the day. Kids clubs: There's a Mini Club for kids ages 4–12 and a Junior Club for ages 13–19. Some properties also offer Baby Club for ages 1–3. Grand Palladium recently partnered with Raggs, a preschool TV show, to reboot its family programming. Activities for younger kids are themed around the Raggs characters.